Physiology is the study of all the physical and chemical processes that take place in organisms in order for them to perform all the functions and activities associated with living. Physiology can be studied at the molecular level all the way up to the level of entire organisms, and includes everything in between like cells, tissues, organs, and body systems. It involves studying how the different parts of the body work, separately and together, to allow an organism to function properly. The modern-day field of physiology has its roots in ancient cultures such as those of India, Egypt, and Greece. The Ancient Greek philosopher Hippocrates believed that the body contained four important fluids called the “four humors”: phlegm, blood, yellow bile, and black bile. He believed that if there was any disturbance in the amounts of these fluids in the body and their ratios to each other, a person would suffer from ill health. For example, too much yellow bile was thought to cause anger, irritability, and jealousy, while too much black bile was associated with being depressed, pessimistic, and withdrawn. These ideas were used in medicine from around 420 B.C. all the way until the 1800s. In 1838, there was a paradigm shift when Matthias Schleiden and Theodor Schwann developed cell theory, which hypothesized that the body was made up of billions of individual cells. This theory was developed through the use of the compound microscope, a tool that became widespread in the 19th century and allowed for the advancement of many types of scientific knowledge. From that point on, scientists began to study physiology mainly in the context of cells, tissues, organs, and body systems. Specialized branches such as gastric physiology and cell physiology arose. The importance of physiology was reflected in Nobel Prize, which began to be offered in the category of Physiology or Medicine in 1901. The first Nobel Prize in Physiology or Medicine was awarded to Emil von Behring, who performed pioneering research on treating diphtheria and tetanus. He injected healthy animals with weakened forms of the bacteria that caused these diseases, and their immune responses made the bacterial toxins harmless. He then transferred this blood serum into infected animals. The infected animals’ symptoms were treated, and it prevented them from dying of the diseases. Eventually, this was performed in humans and saved thousands of lives. This is just one example of the groundbreaking physiology advances that took place during the past 200 years. Today, a main focus of physiology is on the pathology and treatment of diseases at the cellular and molecular level, including diseases such as cardiovascular disease, diabetes, and cancers, along with immune responses. Research is carried out on a wide range of organisms, from bacteria to plants and fungi to animals including humans. There are many different types of physiology; the following is a small subset to show the diversity of the field. Cell physiology: researchers study how cells carry out their processes and interact with each other. Two areas of interest include how molecules are transported across the cell membrane and how neurons transmit electrical impulses. Developmental physiology: looks at how physiology changes during embryonic development and also across the lifespan of an organism. Evolutionary physiology: looks at how physiology has changed over many generations through evolution. It can incorporate behavior, sexual selection, and changes based on geographic range, among other factors. Systems physiology (also known as systems biology): this subfield emerged in the 1990s. It is the mathematical modeling of biological systems, and often focuses on components such as metabolism and cell-to-cell signaling. Researchers use computational models to better understand biological processes. Exercise physiology: the study of the processes that occur in the body during physical exercise. It also looks at the effects of exercise, some of which are long-term. Physiology is closely related to anatomy because it is necessary to understand anatomy in order to study the physiology of specific body parts. 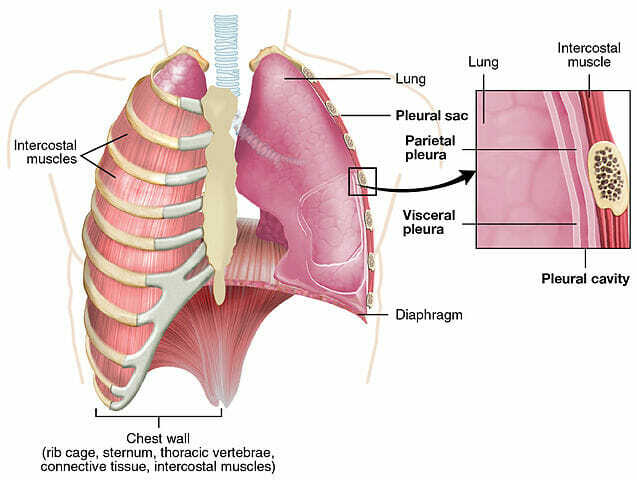 This is a diagram of the human lung and its surrounding muscles. People that are interested in physiology can major specifically in physiology when they are undergraduates at certain universities. However, relatively few schools offer physiology Bachelor’s degrees. Many people instead major in biology or chemistry and then go on for further schooling in physiology. Those who receive a Bachelor’s degree in any of these subjects and want to be involved in the field of physiology often go on for additional schooling. They may go to graduate school, where they will do research, teach physiology to undergraduates, complete a thesis, and ultimately get a PhD or Master’s degree. A PhD is necessary in order to be a professor at a university. Many professors teach and carry out research. Other students may go on to further schooling for a career in healthcare. For example, they may go to medical school, dental school, or veterinary school. Still others may go on to become a pharmacist, physical therapist, or physician assistant, all of which require additional training. As for the physiology major itself, the courses are similar to courses in the biology major, but with a special emphasis on physiology. Physiology majors start their undergraduate career by taking general biology classes and laboratories, and then move on to take more specific classes focusing on anatomy and physiology of bodily systems like the cardiovascular, respiratory, or immune systems. They also take classes in chemistry, mathematics, and physics, which are often taken by biology majors (and are required for medical school). Other courses taken may include endocrinology, biochemistry, genetics, cell biology, and neurobiology. n.a. (2010-09-06). “The Nobel Prize in Physiology or Medicine 1901 – Speed Read.” NobelPrize.org. Retrieved 2017-05-08 from https://www.nobelprize.org/nobel_prizes/medicine/laureates/1901/speedread.html. Newman, Tim (2016-08-12). “Introduction to Physiology: History And Scope.” Medical News Today. Retrieved 2017-05-07 from http://www.medicalnewstoday.com/articles/248791.php. Osborn, David K. (n.d.). “The Four Humors.” GreekMedicine.net. Retrieved 2017-05-07 from http://www.greekmedicine.net/b_p/Four_Humors.html. Thompson, Van. (n.d.). “What Are the Branches of Physiology?” Seattle Post-Intelligencer. Retrieved 2017-05-08 from http://education.seattlepi.com/branches-physiology-7043.html. Westerhof, N. (2011-07-01). A” short history of physiology.” Acta Physiologica 202(4): 601-603. Retrieved 2017-05-08 from http://onlinelibrary.wiley.com/doi/10.1111/j.1748-1716.2011.02286.x/full.